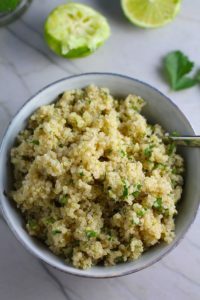 This Cilantro Lime Quinoa Side Dish is fluffy, nutty, citrusy, salty, and the perfect accompaniment for any protein or vegetable! 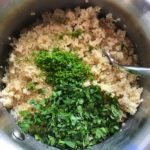 With just a few simple ingredients, you can make this fantastic healthier alternative to rice. 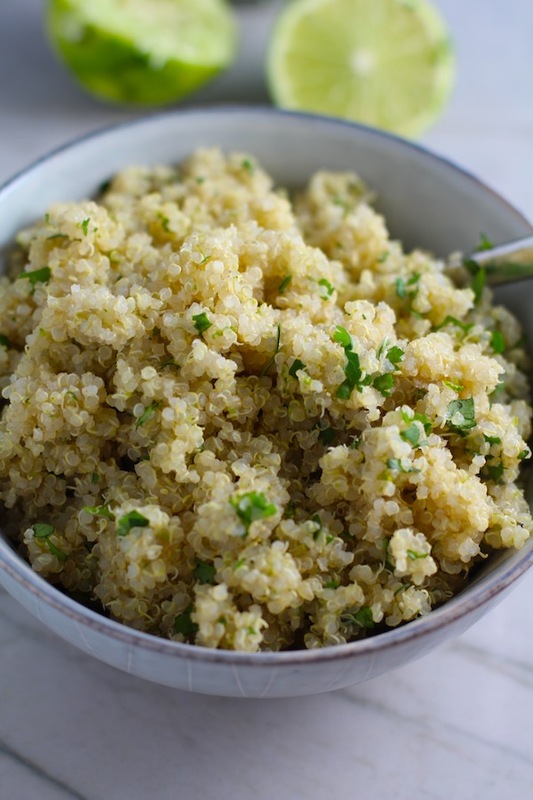 Just 25 minutes to cook the Quinoa, 3 ingredients, and this is yours too! 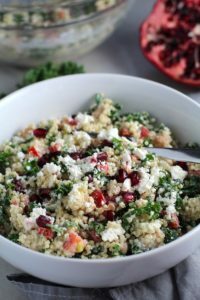 Quinoa is truly a superfood! 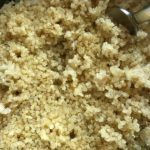 The texture is similar to a couscous, but a little more fluffy. 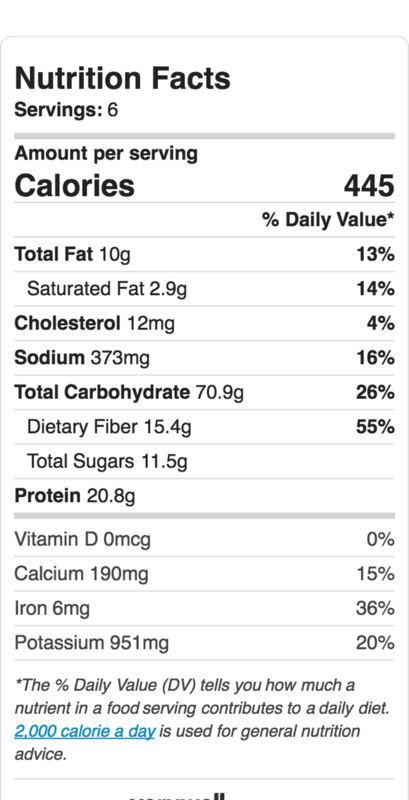 It has a mild, slightly nutty taste, similar to brown rice. However, because it’s so mild, it really absorbs any flavors you mix with it. 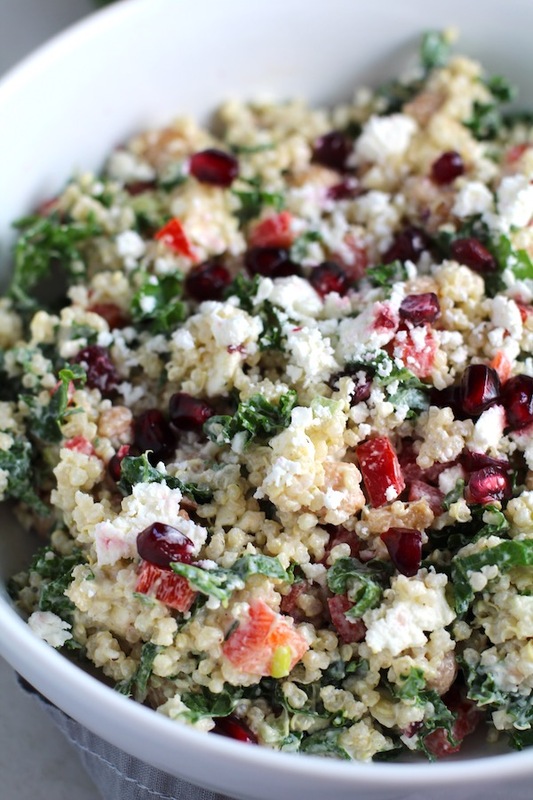 Try these other easy and delicious Quinoa Recipes! Well my friends, not much to this one, so make the entire thing ahead! Woo hoo! 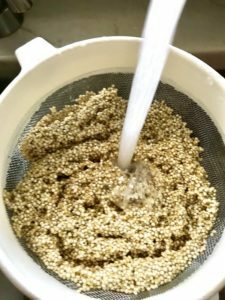 To start, rinse the quinoa in a strainer under water. Then cook it according to package instructions. 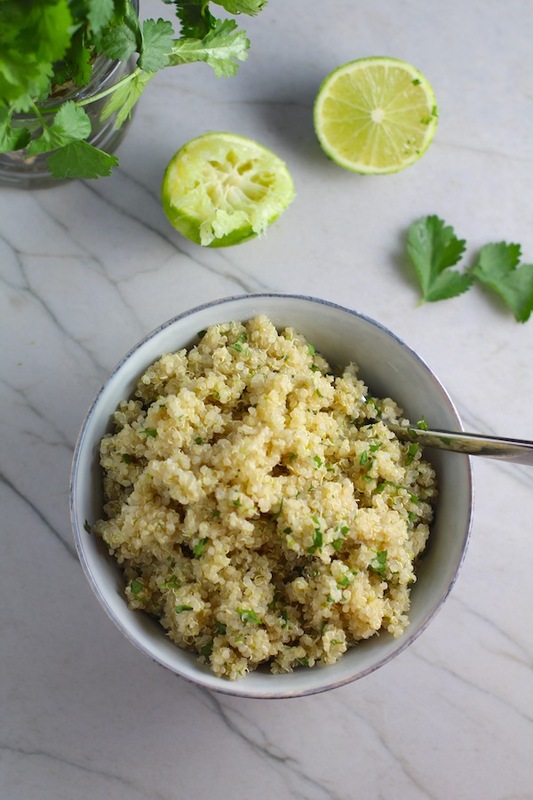 While the Quinoa is cooking, you can zest the Lime and chop the cilantro. 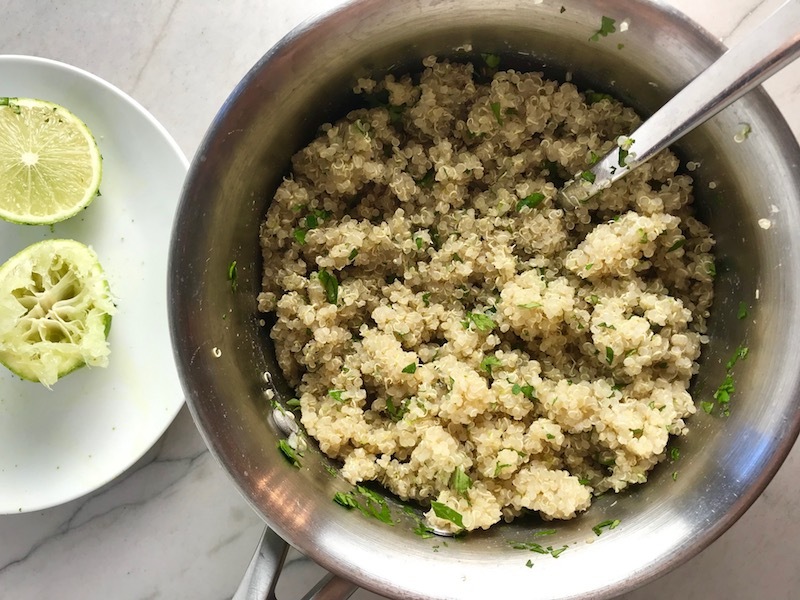 When the Quinoa is done, fluff it up with a fork. 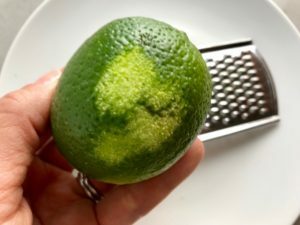 Then add the Lime Zest, a teaspoon of lime juice, the cilantro, and olive oil. 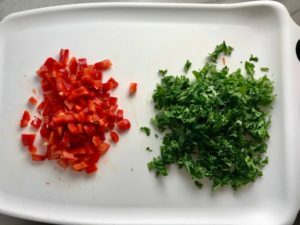 Mix to combine and then taste for seasoning. Add salt as needed. 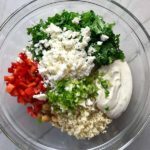 Top with just about any veggie or protein and enjoy! 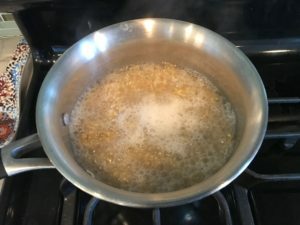 Start by rinsing the quinoa thoroughly in a strainer and then cooking it according to package directions making sure to add a tsp of salt to the water. Welcome to my breakfast, lunch, dinner, and snacks in between OBSESSION! 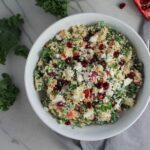 This Quinoa and Kale Salad with Roasted Chickpeas and Creamy Lemon Dressing has everything you could ever want in a meal. It’s fresh, light, and bright from the lemon dressing, kale, scallion, and red pepper. 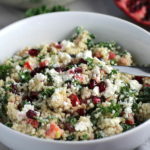 Then it’s hearty, nutty, and salty from the quinoa, roasted chickpeas and Feta Cheese. 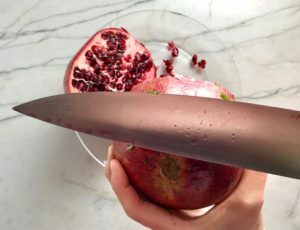 And then you get a burst of fresh sweetness from the pomegranate seeds. And all of the different textures will make your mouth so happy! 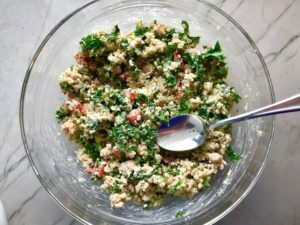 Not only is this delicious and good for you, but it’s incredibly versatile and can be made well in advance to enjoy all week! 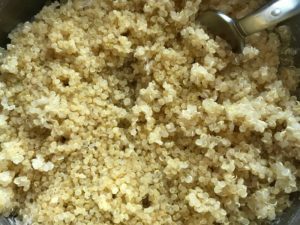 The texture is similar to a couscous, but a little more fluffy. 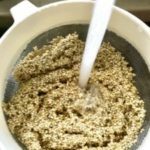 It has a mild, slightly nutty taste, similar to brown rice. However, because it’s so mild, it really absorbs any flavors you mix with it. 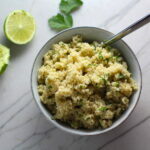 Check out more Quinoa Recipes! 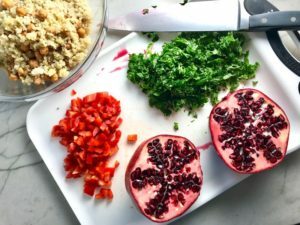 Pomegranate Seeds are also so good for you! 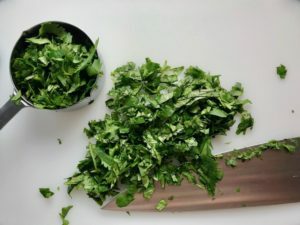 They are loaded with nutrients, have antioxidants, have anti-inflammatory benefits, and so much more. 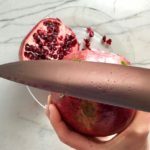 Read more about the many benefits of pomegranate seeds. 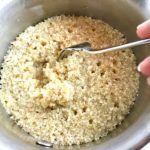 It starts with the quinoa, which you first want to thoroughly rinse with warm water in a strainer. Then you cook it according to package instructions (very similar to rice). Let it cool in the fridge. 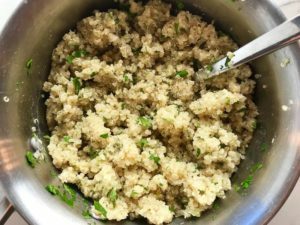 By the way, you can make extra and freeze quinoa. 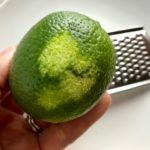 Just spread it out on a sheet pan and freeze, then scoop it into a freezer bag/container. 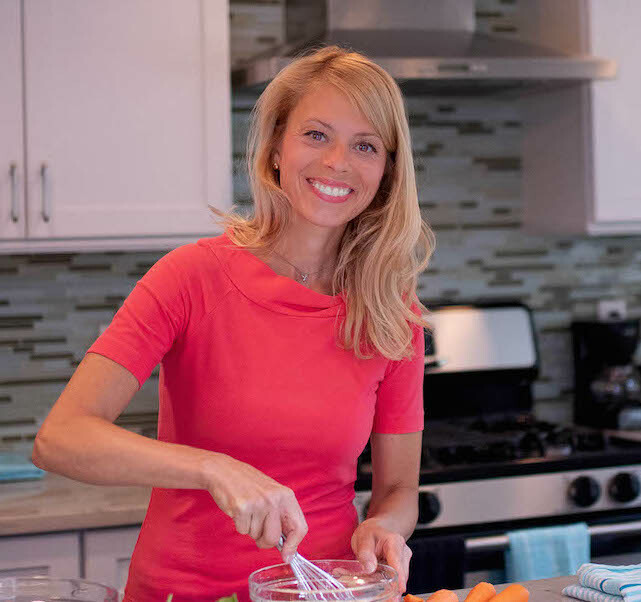 Check out more Freezer Hacks to Save Dinner here! 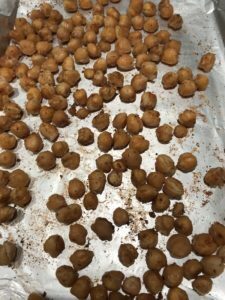 While the Quinoa is cooking, you can also roast the chickpeas. Roasting chickpeas gives them a crispy nuttier flavor and really transforms them into little bites of wonder. 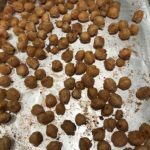 Make the roasted chickpeas by first draining and rinsing them in cold water. Pat dry with paper towel and place on the lined baking sheet. Drizzle with Olive oil and sprinkle with salt & pepper. Toss to coat each chickpea with seasoning. Place in preheated oven and roast for 25 minutes. 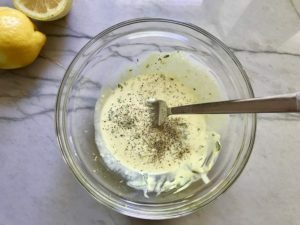 Then make the dressing by combining the sour cream, lemon zest, lemon juice, honey, yellow mustard, parsley. Add a dash of salt and fresh ground pepper. Taste for seasoning and add more salt & pepper if needed. While the quinoa and chickpeas are cooking, prep all of the veggies! 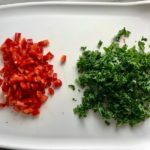 Dice the red pepper and chop the kale. 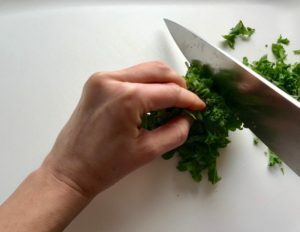 Finely slice the scallion. 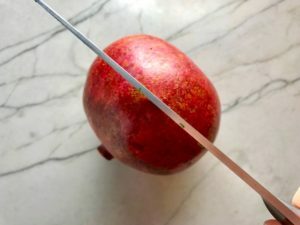 Slice the Pomegranate in half and then holding one half upside down, hit the back with a mallet or the back of your knife to knock out the seeds. 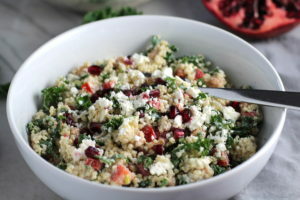 To a large mixing bowl, add the cool quinoa, chickpeas, kale, red pepper, pomegranate, scallion, crumbled feta, and dressing. Then mix to combine. 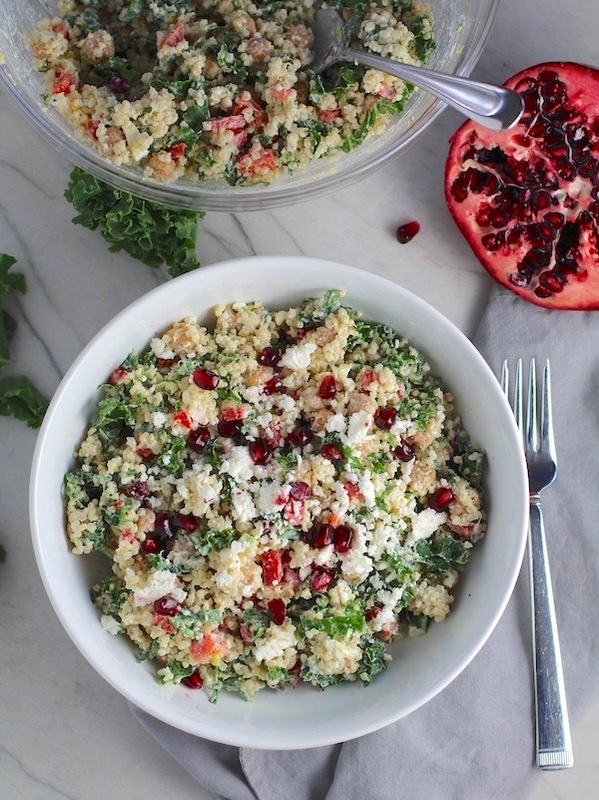 This Quinoa and Kale Salad with Roasted Chickpeas and Creamy Lemon Dressing is everything! It's fresh, light, and bright from the lemon dressing, kale, scallions, and red pepper. 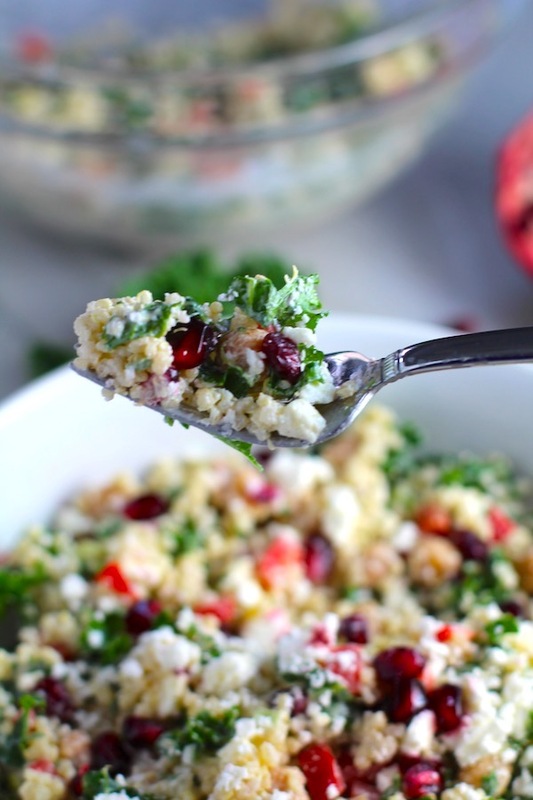 Then it's hearty, nutty, and salty from the quinoa, roasted chickpeas and Feta Cheese. 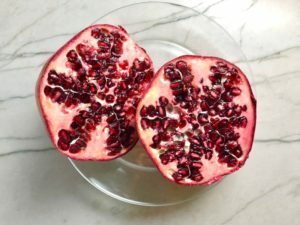 And then you get a burst of fresh sweetness from the pomegranate seeds. 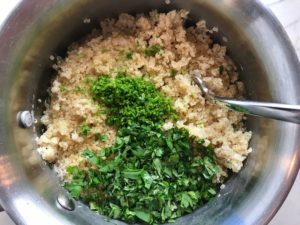 Start by rinsing the quinoa thoroughly in a strainer and then cooking it according to package directions. Let cool in the fridge. 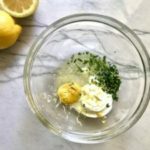 Make the dressing by first, zesting the Lemon and then cut in half and add the juice from only half of the lemon to a mixing bowl. 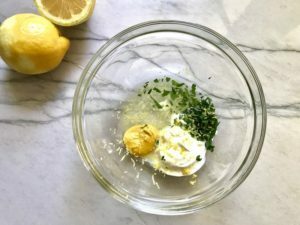 Also to the bowl, add the sour cream, lemon zest, honey, yellow mustard, parsley. Whisk the ingredients together. Add a dash of salt and fresh ground pepper. Taste for seasoning and add more salt & pepper if needed. 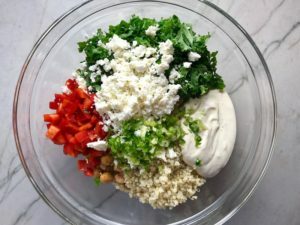 To a large mixing bowl, add the cooled quinoa, chickpeas, kale, red pepper, pomegranate, scallion, dressing and crumbled feta. Then mix to combine. Store in pre-portioned lunch containers, serve as a side or as a main dish. Enjoy!